What kind of commission does coinbase take when you use them? Y'all have my interest peaked, and I'm thinking about dabbling a little. Bitcoin charges a pretty nominal fee around $5. Coinbase charges a little more, somewhere around $7-8 the last time I cashed out around $500 worth of BTC to USD. The link above will help to get you signed up. I was shocked a couple of weeks ago when Glen Beck said that "Anyone who can should throw a date night's amount of money into Bitcoin" just to see what happens. Too much in fees and spread when using Coinbase. However if you use gdax which is Coinbase also, you can trade for zero fees using limit orders. Market orders cost .25 % i think. You'll still need a Coinbase account. Just signed up with GDAX and it's pretty simple to use. The reason why it is doing so good is due to to fiat currencies around the world that got away from the gold standard. Without gold backing a currency, the currency really is only worth the paper it is printed on. There is evidence that the price of gold is being manipulated, keeping it artificially low. Bitcoin has not been manipulated in the same way gold has been manipulated and as I understand there is a set number of bit coins out there and more are not being made. As more people buy bit coin, it’s price increases. Just trying to make sense of this post and pulling out bits and pieces. The US abandoned the gold standard in 1971. There isn't a single major country in the world using the gold standard anymore and hasn't been for quite some time but the recent run up in bitcoin is due to that? Not likely. So fiat currency is only worth the paper its printed on but with bitcoin its not even worth a sheet a paper. So buy bitcoin? The price of gold is being manipulated. What does that have to do with bitcoin? If you want to return to the gold standard and leave a fiat currency then gold manipulation is the very basis on what the gold standard operates on. You don't think there are ways to manipulate a cryptocurrency? Or create more? You can mine for bitcoins and create more. As more people buy bitcoin its price increases. Same for any other asset. This post probably represents 99.9% of bitcoin investors. They don't know what it is, why it exists, or the economics behind it however they buy it because its the latest "investment craze" just like Iraqi Dinars, emus, and Florida condos. You missed the boat. Wish I would've gotten in years ago. Now I can't see myself buying into bitcoin. Litecoin and Ethereum are the up and comers that you may want to get into. Coinbase has done just that. Make an account and you can easily buy/sell through their website. Gemini is another trading website for Bitcoin and Ethereum. I'm talking even easier. You guys are saying they made it easy for people who already trade stocks etc. I'm talking making it easy for the average Joe. Bitcoin is gaining popularity true, but it is going up based on the interest in it. For those of you purchasing or interested in purchasing bitcoin, could you see yourself buying and selling goods using bitcoin? I think there is a place in the marketplace for bitcoin, on the institutional side where it makes sense as an easy way to exchange currency, however for the individual consumer, I think bitcoin still has a very long and tough stretch ahead to make a dent in the marketplace. On the same token, I think gold is a terrible investment vehicle as well. sure wish i would have bought bitcoin when i heard about it nearly 3 years ago...at the time it seemed like a high risk that wouldn't take hold...so far its holding. You just need to do a little research to find out what it really is. Like I mentioned before, I think it's the technology behind it that makes it so valuable. Right now I'm making a little money playing with it as currency but I think it will eventually develop into so much more. I could have never imagined streaming live content let alone autonomous cars. Yet, here we are. so lets say I have 100.00 dollars....i see where litecoin is 92...do i just buy one litecoin to get started? What is GDAX? I remember reading an article where congress was trying to pass something related to "combatting money laundering, terrorist financing and counterfeiting act of 2017". If I rember correctly it mentions digital currency. Coinbase is a digital/online wallet. GDAX allows you to buy and sell crypto currency in real time values like the stock market. Beck is talking Bitcoin again right now. If your scared do like I did. Get in hold it about a month and get out. I made 12k off 3 coins I purchased when it was 2100 a month or so ago. I got nervous at 6100 6200 and sold the 3 I had. I'm not looking back either... I'd buy it now while it's a buzzword and gaining popularity if you are going to do it. Trust me I don't see the value in it either. The CME is said to start trading futures on BTC by mid December. I guess that would be one way the the gov't could get their hands on the money people are making on it. Plus every government prints billions upon billions of currency to stay afloat. Do people even realize how much they pay in inflation taxes due to printing of money? Take either of these things away or partially away and our governments collapse. Ever heard of apple pay? samsung pay? android pay? google wallet? people use these services every day and paying with crypto is just as easy....once more merchants accept it. You can also order a debit card, that spends from your bitcoin, so you can use it anywhere even withdraw cash from atm. I use one. amazon is about to launch some crypto stuff as well. accepting it, their own marketplace exchange etc. i dont think the current bitcoin will be the primary currency used for everyday transactions. its slow, fees are too high etc. either a fork will take it over or another currency will rise. there some that are instant and fee less. as a currency, its just a better ledger system. your bank is just a ledger. the difference is you control your own money with the same conveniences as banking. the bank will invest your money, loan your money etc without asking you and giving you peanuts in return. if you are in control, you choose. this also means you are in control of your own security as well. Imagine a voting system. Every registered voter is issued a token and wallet. simply holding that token entitles you to a vote. each person could vote for every single bill and law introduced, elected officials etc. all on a smart contract on the blockchain. you cant hack it, alter it etc. it is verifiable by anyone. if it was as easy as opening a smart phone app or go online to vote i believe more would do it. by the people for the people. you can create a company, where the shareholders vote on every major decision. tons of uses are popping up. there is a new power company making partnerships that allow people to trade unused electric instead of selling it back to the electric company. check it out, some really cool stuff being done. and anyone can do it. Samsung pay and apple pay both use US backed currency as payment forms is what I'm getting at. I agree with you on the uses of the systems have a lot of potential. However, I'm looking at it from a currency/investment. Obviously the price has soared and it has been a great play as a high risk investment. Although I don't see it remaining that way in the long term. I'll look into what you were referring to. I am definitely not an expert on this at all, just not quite ready to invest my money or others. Seeing it as a currency, do you think there is a potential that people don't value the bitcoin as high as it is currently? speaking of, now imagine a war arises. instead of printing all the money we need. that money would have to be funded through the people, corporations, and foreign governments. if no one sees the point , the war doesnt get funded. some interesting concepts to ponder. That’s not quit what I was getting at, on most of the post. Maybe I didn’t explain it very well, so let me elaborate. First, I am not saying getting countries off of the gold standard is what is driving bitcoin. I’m saying that investing in our own currency is not what it used to be so people are looking for alternatives. Because the gold price is being manipulated (even though most people don’t see or understand this is happening), you are not seeing a sharp rise in the price of gold. So people are going investing where the big profits are. I understand fully that bitcoin prices can be easily manipulated and I am not saying that bitcoin is a great investment. I was explaining(in a poor way I guess) as to why bitcoin is so popular. Very few “investors” actually do any research. They just go by what will line the pockets of their financial planner without really looking into things. Personally, my investments are with physical precious metals(not certificates). Do they have the highest returns? No. But precious metals have never been worth nothing. Keeping money in a bank is also a poor choice in my opinion. Those that are putting bitcoin down that also keep a large amount of money in the bank are hypocrites. Banks do not have your physical money on hand. They keep a small amount of cash on hand to cover day to day transactions. The money in your bank is just a number on a computer screen that can be hacked and changed, the same as bitcoin. The FDIC also does not even have enough funds to cover just one bank collapse. For example, if Chase bank were to collapse and you had all of your retirement funds in a savings account there, you MIGHT get $0.25 for each dollar you had in there, if you were lucky. So to start buying and selling in this all you need is a coin base app? The way things are looking right now you would be goofy to not jump in. Not to throw this off the crypto currency track, but for you guys who are vested in gold and precious metals....how far off do you think we are from being able to produce these ourselves? Bitcoin is high risk, kinda like penny stocks. Glenn Beck made a good point recently. He said if you invest in bitcoin, only put the amount of money into it that you are willing to loose completely. High risk investments are not for everyone. Could you walk away from it with a bunch of profit? Yes. Could you also loose it all? Yes. 100% agree from the investment side. Leave out that Beck fellows name and you have a winning statement. I agree with the above statement RE: "only putting in what you are willing to lose". Regarding not being able to spend digital currency...there are many Tech companies that do accept digital currency, and many more moving towards this ability. Still not implying this is a safe investment, but its ability to purchase goods and services appears to be getting legs. To buy bitcoin do have to get the whole thing at almost 10k or can you buy in at any $$ amount? you can buy any amount. This screams that the easy money has already been made. No telling how long it can still rise but once the majority have bought that only leaves sellers. Once the tide turns will there be any buyers left to support the price? you can buy increments of bitcoin. you do not have to buy a whole one. not giving any investment advice and not recommending anyone buy anything in particular. i like to buy and hold coins in the 11-50 spot on coinmarketcap, that i understand and believe in. especially cheap under $1 that allows me to buy a bunch. stole this post back from nov 23rd. "If you took 5 of the coins that are still in the top 10 from Jan. 1, 2017 compare them to Nov. 23, 2017 here is what you would have if you invested 1k in each on Jan 1st 2017. For a grand total of $164,369.00 for $5,000 invested!!! That's over 33X your 5k investment. That's 3,300% gains!!" If your talking about bitcoins, you can buy the machines, and mine yourself. About a 4 month wait on a Litecoin machine, and close to a year for a Bitcoin machine. Not to be confused with the pyramid scheme, where they try to get you to invest in the machines, and then get your buddies in, etc... I'm talking, strictly mining for yourself. 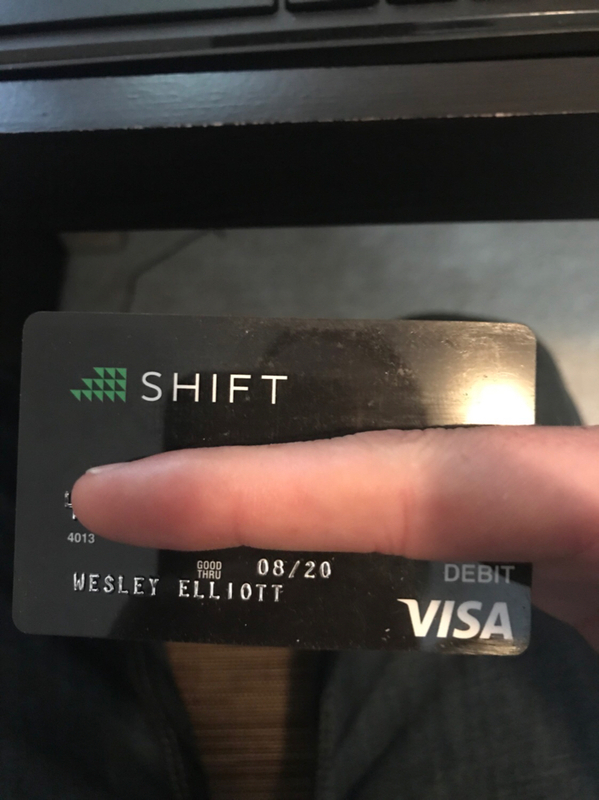 What debit card do you use that allows you to spend BTC? Up to the 1million decimal point I believe. there are several, but i use "shift". download the app and it links to your coinbase and they send you a card. you can wait to use it on good days when the market is up really well and its like getting a nice discount on anything you buy. My brother told me about that one today. Are there any fees associated with using it? Is it only for using BTC or can i use it anywhere USD is accepted? fees are listed here. basically $10 for the card and free to spend. atm fee if you need to withdraw. Just ordered mine...thanks for the heads up. But people said that when Bitcoin first ran up to $350. Then when it ran to $1,000 more people said the same..and on and on and on. Well, I COULD be wrong. I was once. If your cab driver gives you stock tips, sell. Somebody in my office just represented a home buyer who bought $100 worth of bitcoin many moons ago when they were around 3 pennies each. Not even 40 and could retire for a few lifetimes; sure would be nice! Do y'all just have yalls debit card on the app or do y'all actually use your bank account? I'm a little hesitant to put my bank account on there.